One of the most commonly asked questions I have had during the span of my golf course career is “What do you do during the winter?” The answer to this question has always been different over the years, but I am realizing that this is a very good question. Once the golf course closes in October, we normally don’t get to see the golfers until the following spring when several months have passed. However, when the golf season ends in the fall, golf course maintenance season does not end and it continues right up and into the next season. 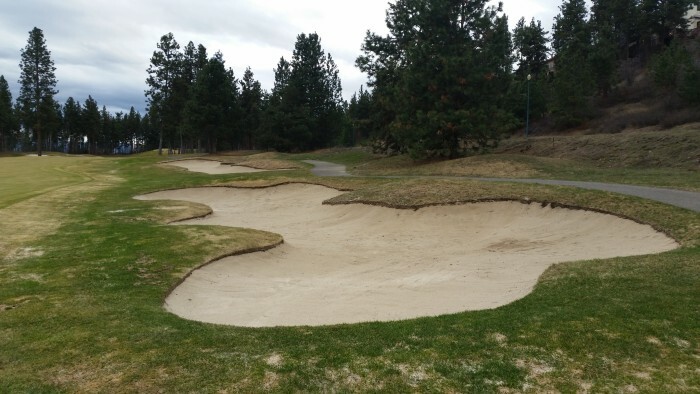 There are all kinds of projects and tasks that can be completed during the off season, and I would like to give a bit of an idea of some of the things the Okanagan Golf Club maintenance department has been up to during the winter months of 2014 and 2015. While the crew in winter is quite a bit smaller, there are many important things that need to be done to connect the end of one golf season to the beginning of the next. Something that never stops is the maintenance of all the golf course equipment. This literally takes every single minute of the off season to prepare everything for a busy golf season. This includes full rebuilds, services, mower sharpening and just about anything else you could imagine. The equipment gets used so hard during the golf season that there is just not enough time to complete all of this work in that time. Mechanics work full days all winter to ensure the whole fleet of over one hundred individual pieces of equipment are in pristine operating condition when golf begins. Another major procedure that we do in the off season is tree work. Just over 100 acres of the 300 acre golf course facility is comprised of trees. The off season gives a chance to do many things that are not possible during the golf season – such as falling large trees that pose safety risks, clearing understory, and processing wood debris. In November of 2014 alone, about 200 labour hours were spent chipping wood debris on course. 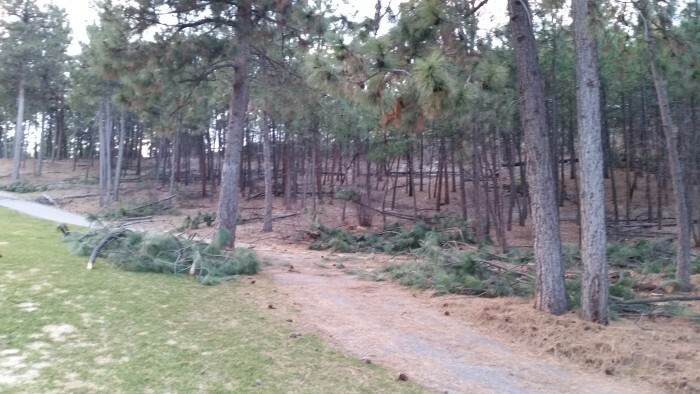 Tree work was the single largest project that was tackled during the off season with another 300 labour hours spent chipping and mulching throughout both courses in March of 2015. The final tally saw about 500 trees cut, processed and chipped as well as many trees pruned. Grinding of many of the visible stumps from these trees will be complete before opening of the Quail course on March 25. Winter months are crucial for Poa annua greens such as we have on the Bear course. 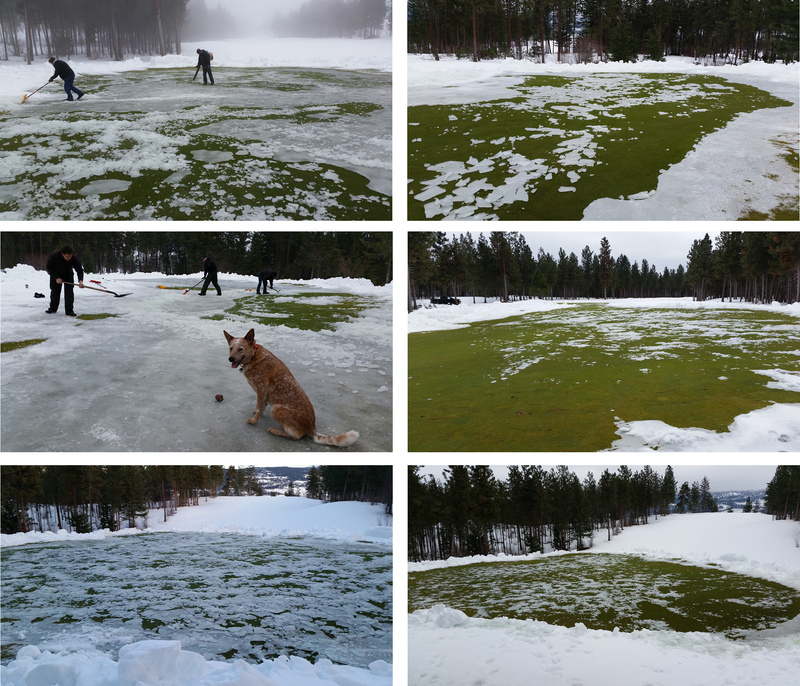 Our specific site location in Kelowna has a high potential for ice formation on golf greens and can be very detrimental to spring health of the Poa annua turf. This species of grass generally speaking can handle between 45 and 75 days of being covered with ice. In this past winter season, ice formed on the golf course very early on November 25, 2014. The golden opportunity arose on January 25, 2015 where the daily high temperatures went to double digits, and there was a potential to remove ice. This was a busy 10 days with a small crew tediously trying to remove ice off of frozen turf with the use of leaf blowers, shovels, picks and hoes. Once the ice was removed from several greens in late January, cylinder plugs were brought inside to incubate under ideal growing conditions – full sun and 20 degrees Celsius. This is done to help determine if any damage has been sustained in the Poa annua plants and if there is extra attention needed in the spring. Luckily this winter we were able to remove the ice in time so that no damage was done the Poa annua greens. Some of the plugs brought inside showed signs of weakness in the first few days, but after a week or so of growing under perfect conditions, they showed a good response. We are now just seeing that play out on our front 9 bear greens, as they are all now showing growth throughout the greens surface. This is a good sign that play will soon be possible on these greens. The second major project of the spring next to tree work, is bunker work. The crew has been working super hard to finish a number of bunker restorations on the Quail course. Specific bunkers of note include two fairway bunkers on the right hand side of 17 Quail, all of the greenside bunkers on #14 Quail, two fairway bunkers on #13 Quail, #12 Quail fairway bunker, #11 Quail greenside bunker, and #10 Quail greenside bunker. All greenside bunkers that are not receiving a full restoration, are at least getting some edge maintenance and having sand re-distributed to make them even, and much more playable. One of the key focuses of this procedure has been to make the sand as consistent as possible form one bunker to the next. It will take several years to be completely rid of the old silica type sand that becomes extremely crusty and hard after being wet and then dried out from the sun. There are a number of other good news projects underway at the golf course. Some notable carpentry projects include a new cedar fence around the Lockhart room patio, complete new shingling and siding of the pumphouse at #18 Quail, and a new bunker bridge at the of back of #14 Quail. 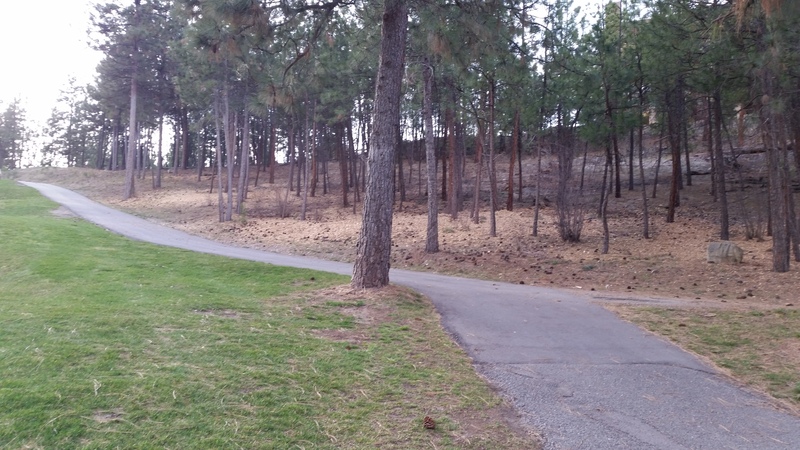 There will also be several cart path areas that will receive new surfaces around both the Bear and Quail this spring once the weather allows for asphalt paving. The most exciting new project for the upcoming season is the resurfacing of the remaining 7 greens of the back 9 Bear from Poa annua to creeping bentgrass (Agrostis stolonifera). While the spring of 2014 forced its hand to cause sodding of #12 and 16 bear greens to bentgrass, this spring will be at our own will. It has been my goal since arriving at the Okanagan Golf Club in 2013 to eventually convert remaining Poa annua greens to creeping bentgrass. The huge success of sodding 12/16 last year has proved the absolute positivity of converting the rest of the back 9. 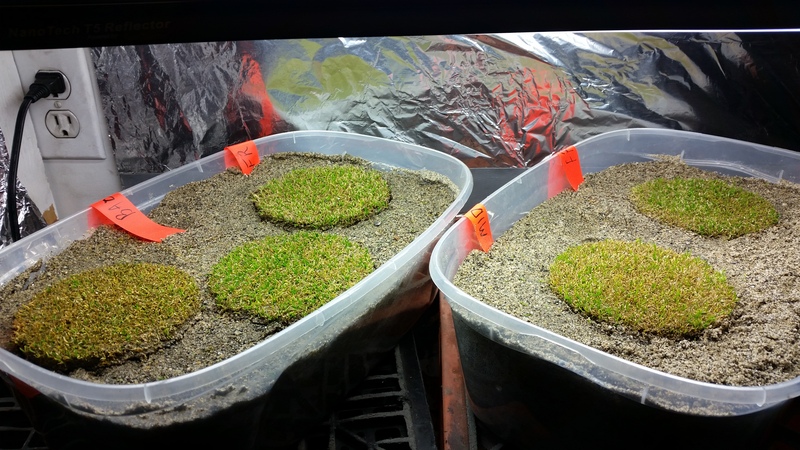 The list of advantages of having creeping Bentgrass over Poa annua is vast, but the main advantage is that it will provide predictability in subsequent springs and allow the course to open much earlier than the Poa annua greens have allowed in their short history. 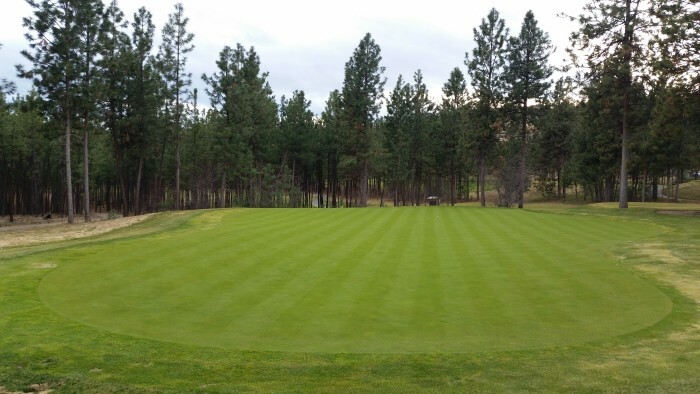 The condition of all the bentgrass greens onsite in the past 3 springs has proven they can withstand varied winter conditions and thrive in the early season. I can honestly say that in my entire career I have never been more excited about opening a golf course than I am this season! An early start combined with a long list of projects and wonderfully healthy bentgrass greens gives me only reason to be ecstatic. I hope just reading this information peaks everyone’s interest, and I am positive that you will also be very impressed once you play your first round on the Quail course this season, and especially the back 9 Bear once it is ready to go. See you all out on the course!